Pre-drawn computer network symbols representing computers, network devices plus smart connectors help create accurate diagrams and documentation. Draw detailed Computer Network Diagrams, Designs, Schematics, and Network Maps with Edraw in no time! Pre-drawn network symbols representing computers, network devices plus smart connectors help you create precise diagrams and documents. We also offer special and highly detailed libraries, accurate shapes and computer graphics, servers, hubs, switches, printers, mainframes, face plates, routers etc. for Computer Network, Telecommunications, Wireless Internet, Power, Storage and other equipment. All the network symbols are free to download. Ethernet serves as the basis for the IEEE 802.3 standard, which specifies the physical and lower software layers. Straight bus is an arrangement in a LAN in which each node is connected to a main cable or link called the bus. FDDI ring is a standard for data transmission in a local area network which uses optical fiber as its standard underlying physical medium. Star network is a LAN in which all nodes are directly connected to a common central computer. Router is a device that forwards data packets between computer networks, creating an overlay internetwork. Bridge helps to filter data traffic at a network boundary and reduce the amount of traffic on a LAN by dividing it into two segments. Switch is used to join multiple computers together at a low-level network protocol layer. Mainframe is a big computer. Super computer is a computer at the frontline of contemporary processing capacity. Internet cloud denotes the demarcation point between what the provider was responsible for and what users were responsible for. Hub joins multiple network devices together to form a single network segment. Modem modulates an analog carrier signal to encode digital information and also demodulates such a carrier signal to decode the transmitted information. A-B switch is a device used to split signal between cable and antenna or other inputs. Diagnostic devices are used in diagnosing and troubleshooting the network problems. These tools can be used to check the availability, route, and health of a system in network using ICMP and SNMP. Biometric reader is the most popular and most common form of biometric security devices used. Repeater is used in transmission systems to regenerate analog or digital signals distorted by transmission loss. XML web server is a special purpose network device used to secure, manage and mediate XML traffic. Fiber optic transmitter is a device which includes a LED or laser source and signal conditioning electronics that is used to inject a signal into fiber. 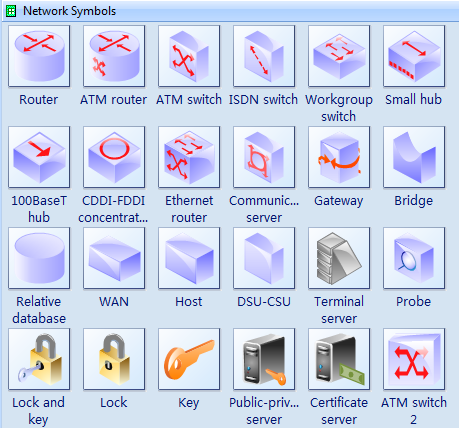 The most common symbols used to represent logical network diagrams are shown below. 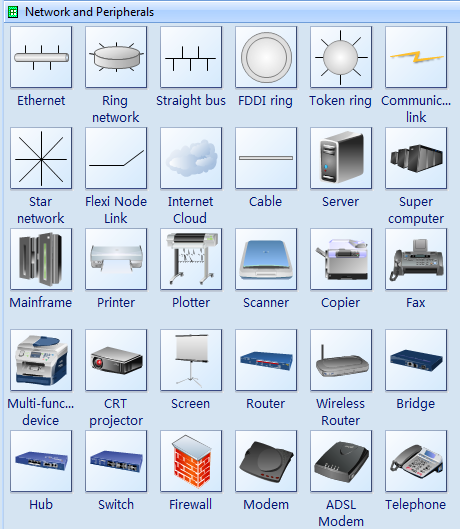 The most common symbols used to represent computers and monitors are shown below. 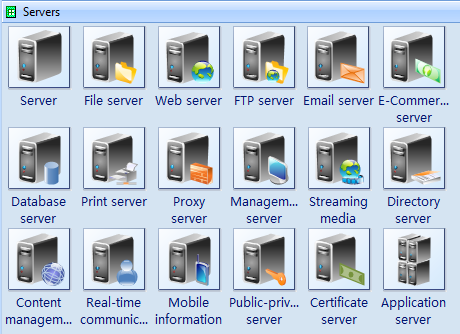 The most widespread symbols to represent servers are shown as follows. 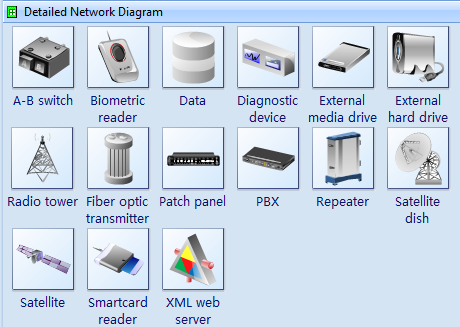 Need fresh looking network symbols for your network diagrams? These network symbols are a cinch to pop in. And their crisp, fine detail will make spectacular, easy-to-understand diagrams and presentations to your customers. With the wide variety of LAN and WAN symbols in this set, you can make changes quickly with ease.